I love that I can prep a meal in a few minutes and pop it into the Crock Pot and dinner is done. But I'm having an issue with sides this year. Normally I'll roast a vegetable as a side or make a salad to go with the main entree. On Tuesdays I don't get home from the dance studio until 7 and my kids' bedtime is 8. Which means I"m on the lookout for more all in one Crock Pot meals. Enter this meatloaf and mashed potatoes. They are cooked in the same Crock Pot. This is the easiest meal to put together and the mashed potatoes come together in a flash once they are cooked. You can even put all the cream, butter, salt, and pepper in a mixing bowl in the fridge ready to go for dinner time. Yes, I'm that pressed for time that I prepped the mashed potatoes add ins before leaving for dance. You're going to make a little aluminum foil dam for the meatloaf. The foil acts like a barrier for the fat. Now your meatloaf won't be sitting in grease. 3/4-1 cup heavy cream or milk - I use cream but milk is healthier. 1. Saute onions and garlic on olive oil until soft. 2. In a large bowl add egg, salt, pepper, horseradish, and Worcestershire sauce and mix together. 3. Put the bread in the blender and make bread crumbs. 4. Add ground beef, bread crumbs, and onion to the egg mixture and combine. I use my hands, it is the easiest way in my opinion. 5. Take 5 strips of aluminum foil and roll into little logs. 6. Place aluminum foil in the Crock Pot. 7. Shape meat mixture into a loaf shape and place on top of the aluminum foil. 8. Spread a thin layer of ketchup or barbecue sauce over the meatloaf. 9. Sprinkle 1/4 of the minced garlic on a strip of aluminum foil. Place a peeled potato on top of the garlic and wrap the foil around the potato. Place the potatoes in the Crock Pot. Cover the Crock Pot with the lid. 10. Cook on low for 4 hours. 11. Turn off the Crock Pot. Remove the potatoes from the Crock Pot and unwrap the potatoes and place in a medium size bowl. Put the garlic in the bowl too. 12. Add 3/4 milk, butter, salt and pepper to the bowl. Mash the potatoes using a hand held mixer on the lowest setting. Add additional milk if needed. Some people like them really creamy so add milk gradually until you have the right creaminess for your taste. 13. 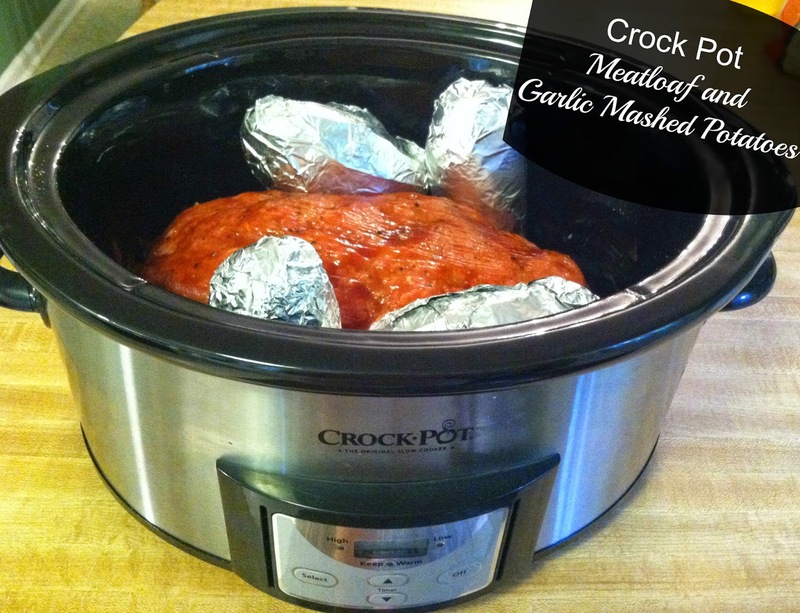 Pull the meatloaf out of the Crock Pot and dinner is done! I didn't think this recipe would be 13 steps, but I swear it is easier than 13 steps looks. Try it and tell me how it turns out for your family. 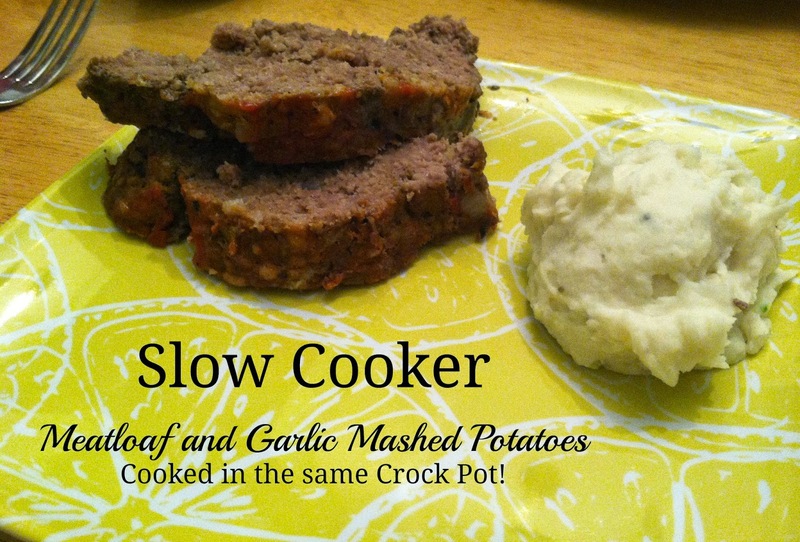 Great tricks to make both meatloaf and potatoes in the same crockpot! Glad I found this at the DIY Fall Craft SITS Linky! This is an amazing recipe... Pure genius! Thank You so much for sharing this.. I came across this by google images and just clicked "go to page" and I am soo glad I did! Thanks! I'm glad you liked it, it's a family favorite.